2009-10 UD Be A Player Hockey HOBBY Pack 1 Auto (John Tavares Crosby Kane)? "YOUNG GUNS ROOKIE CARD". "1-2018 / 2019 UPPER DECK SERIES 1 NHL. Every box or case has at least one major hit. WHO THE PLAYER IS I DO NOT KNOW. "2018-19 NHL ROOKIES". *SPx Retro Hits o 1997-98 SPx Retro - inserted 1:3 o 1997-98 SPx Retro Rookies - inserted 1:6 o 1997-98 SPx Retro, Grand Finale // - #'d to 50 o 1997-98 SPx Retro Rookies, Grand Finale // - #'d to 50. "1-2017 / 2018 UPPER DECK SERIES 1 NHL". Every box or case has at least one major hit. Upper Deck. Net Cord Cards from 2013 Stanley Cup Finals. Net Cord Cards from 2012 NHL Winter Classic. 2013-14 (2013 - 2014). --- May contain expired redemption cards ---. 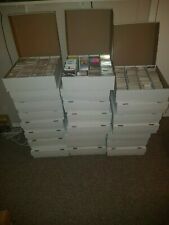 100 Rookie Cards #'d to Jersey Number! 2010-11 Upper Deck SPx Hockey HOBBY Pack Rookie Auto/Jersey/Patch? Upper Deck SPx Hockey. 2010-11 (2010 - 2011). Look for Rookie & Memorabilia/Autograph Hot Boxes. NEW for 2008/09!! Fight Strap cards make their debut, featuring Single and Dual versions! target0007 Presents:2008-09 Upper Deck NHL Sp Game Used Hobby Pack. target0007 Presents:2008-09 Upper Deck Artifacts Hockey. Jersey, Patch or Jersey/Patch Cards numbered to 199 or less find (2) Artifacts Rookie Cards and (1) Rookie Redemption Card per box! "1-2013-2014 UPPER DECK SERIES 1 NHL. JERSEY / PATCH OR AUTOGRAPH". "JERSEY / RELIC / PATCH OR AUTOGRAPH CARD". "2013-14 NHL KEY ROOKIES AND AUTOGRAPH'S". Every box or case has at least one major hit. Jonathan Marchessault Spgu Stanley Cup Finals Game Used Puck 1:720 packs!! RARE . Condition is Brand New. Shipped with USPS First Class Package. 2001-02 Upper Deck Premier/Ultimate HK Collection Hobby Pack Rookie Auto/Jersey? 2001-02 (2002) Upper Deck. Premier (Ultimate) Collection Hockey. serving the Hobby for more than 20 years. base set, inserts, auto, relic. etc. For any single cards needs to complete your sets. Lightning Fast and Secured. 2009-10 Upper Deck O-Pee-Chee Premier Hockey 5cd HOBBY Pack (RC Auto Patch Jsy)? O-Pee-Chee Premier Hockey. 2009-10 (2010) Upper Deck. we look forward to hearing from you again! 2015-16 Upper Deck Champ's Hobby Packs - McDavid, Eichel, Larkin RC, GU, AUTO! This series includes exclusive rare Rookie cards of Connor McDavid, Jack Eichel, Dylan Larkin (and Auto/GU of each) and many more great cards. One of the better series of the past few years! 2009-10 Upper Deck Hockey. Be A Player. serving the Hobby for more than 20 years. --- May contain expired redemption card ---. For any single cards needs to complete your sets. base set, inserts, auto, relic. etc. "1-2009 / 2010 "UPPER DECK BLACK DIAMOND" NHL HOCKEY". 2007-08 Upper Deck O-Pee-Chee Premier Hockey 5cd HOBBY Pack (RC Auto Patch Jsy)? O-Pee-Chee Premier Hockey. 2007-08 Upper Deck UD. 1 Manufactured Patch Card! 1 Jersey, Patch or Regular Card Parallel. we look forward to hearing from you again! "1-2006 / 2007 "UPPER DECK SPX" NHL HOCKEY". 2006-2007 KEY ROOKIES NHL?. NHL ROOKIES. "1-2010-2011 UPPER DECK SERIES 1 NHL. JERSEY / PATCH OR AUTOGRAPH". "JERSEY / RELIC / PATCH OR AUTOGRAPH CARD". Every box or case has at least one major hit. 2010-11 NHL KEY ROOKIES. The year’s holdover crop is stronger than ever before, with Toronto’s Nazim Kadri, Montreal’s PK Subban, Boston’s Zach Hamill, Ottawa No. 1 pick Jared Cowan & more! Also look for possibly pulling many different Autographs, Material Cards, and Serial Numbered Cards. "QUAD JERSEY / QUAD JERSEY AUTOGRAPH / ROOKIE QUAD JERSEY AUTOGRAPH OR. QUAD JERSEY. "1-2010 / 2011 UPPER DECK BLACK DIAMOND NHL. Every box or case has at least one major hit. WHO THE PLAYER IS I DO NOT KNOW. 2010-11 Panini Limited Hockey 8cd HOBBY Pack (RC Auto Patch Jsy 1/1 Cut Sig)? 2010-11 Panini Limited Hockey. 2 Commons #'d to 299 or less. we look forward to hearing from you again! One Autograph #'d to 299 or less. "1-2008 / 2009 FLEER ULTRA NHL. "JERSEY / RELIC / PATCH OR AUTOGRAPH CARD". Every box or case has at least one major hit. WHO THE PLAYER IS I DO NOT KNOW. 1991-92 O-Pee-Chee Premier Hockey. LOCAL PICKUP. Look at the pictures to see more of the condition of this item. 2010-11 Pinnacle Hockey HOBBY Pack Taylor Hall Auto Rookie Jersey? Crosby? 2010-11 Pinnacle Hockey. Rookie Cards. Jersey Cards. serving the Hobby for more than 20 years. --- May contain expired redemption cards ---. base set, inserts, auto, relic. etc. For any single cards needs to complete your sets. "2013-14 NHL KEY YPUNG GUNS ROOKIES AND AUTOGRAPH'S". YOUNG GUNS". "YOUNG GUNS CARD". "1-2013-2014 UPPER DECK SERIES 1 NHL. WHO THE PLAYER IS I DO NOT KNOW. Every box or case has at least one major hit. "1-2009 / 2010 UPPER DECK TRILO3Y NHL". "AUTOGRAPH / SERIAL #ED AUTOGRAPH / R/C AUTOGRAPH OR A SERIAL #ED. Every box or case has at least one major hit. 2009-2010 upper deck NHL rookies. WHO THE PLAYER IS I DO NOT KNOW. 2010-11 Panini Zenith Hockey HOBBY Pack National Treasure? Auto/Patch/Jersey? 2010-11 Panini Hockey. serving the Hobby for more than 20 years. --- May contain redemption cards ---. base set, inserts, auto, relic. etc. For any single cards needs to complete your sets. target0007 Presents:2012/13 OPC O Pee Chee Hockey. OPC Signatures – inserted 1:192. NEW: Find NHL Team Logo Patches, averaging 4 per case! (NEW) Look for NHL Superstar Pop-Up Cards, averaging 2 per box! target0007 Presents:2009-10 ITG In The Game 1972 Hockey Cards. Lot of 2 Packs. Please note, this auction is for mutiple packs and not boxes. 2 Pack Lot. 9 Cards per pack. "1-2009 / 2010 UPPER DECK TRILO3Y NHL". AUTOGRAPH OR A ROOKIE ICE SCRIPTS AUTOGRAPH CARD". "ICE SCRIPTS. Every box or case has at least one major hit. 2009-2010 upper deck NHL rookies. WHO THE PLAYER IS I DO NOT KNOW.